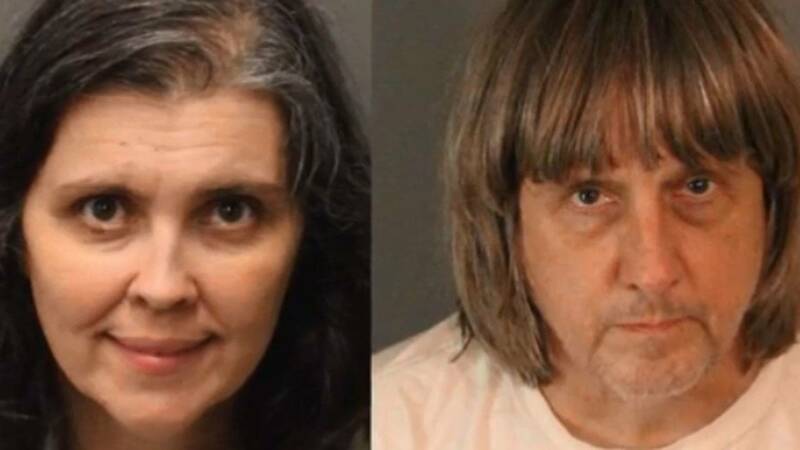 Louise and David Turpin, California parents of 13 children accused of torture. (CNN) - David and Louise Turpin projected an image of a picture-perfect family on social media. They posted photos of themselves with their 13 children, smiling as they celebrated birthdays, renewed wedding vows and visited Disneyland together. In the photos, the couple's children wore identical clothing based on gender and often had the same haircuts. "They all dressed alike when they went out," Betty Turpin, David's mother, told CNN. The couple would line the children up according to age, she said, and the parents took their positions at the front and back of the line, for "protective reasons." "It was easier to keep up with the kids" that way, their grandmother said. "They were very protective of the kids." David, 56, and Louise, 49, are accused of holding their children captive in their Perris, California, home in filthy conditions, some of them shackled to beds with chains and padlocks. The 13 siblings range in age from 2 to 29. The parents are charged with torture and child endangerment, and scheduled for a court hearing Thursday. Bail was set at $9 million each. It was not immediately clear if the suspects had attorneys or whether they had entered a plea. On Sunday, one of their daughters, a 17-year-old, managed to escape from their home by climbing out a window and called 911 from a deactivated cell phone she found in the house, police said. She told officers her parents were holding her 12 siblings captive inside the home, the Riverside County Sheriff's Department said. The teenager had photos to support her story, Riverside County Sheriff's Capt. Greg Fellows told reporters Tuesday. "I wish I could come to you with information that would explain why this happened, but we do need to acknowledge the courage of the young girl who escaped from that residence to bring attention so they can get the help they so need," Fellows said. Neither law enforcement nor child protective services had been called to the home in the past, officials said. Fellows, who likened the siblings' treatment to torture, said their mother was "perplexed as to why" authorities came to her home. Sheriff's deputies found 12 victims there who "appeared malnourished and very dirty." Several were shackled to their beds "in dark and foul-smelling surroundings," the sheriff's department said. All looked like children, police said, and officers were surprised to learn that seven of them are adults. The adults are being treated at Corona Regional Medical Center in Corona, and the six children are at Riverside University Health System Medical Center in Moreno Valley. "It's hard to think of them as adults," said Mark Uffer, Corona Regional Medical Center CEO. "When you see them, they're small. They're stable. They're being fed." Daniel Hoffman, a professor of nutritional sciences at Rutgers University, told CNN that growth is essentially halted at the age at which undernutrition begins. "The problem is not having enough energy or micronutrients -- key nutrients like zinc, folate, iron -- for an extended period of time," he said. "Kids can become 'stunted,' meaning they're shorter than should be for their age. If you lack micronutrients, you can meet energy to live everyday and even have a normal body weight, but growth can still be stunted." Fellows said that, so far, there was no indication of sexual abuse. Six of the siblings are under 18, he said. Three were chained to furniture, according to the sheriff. The family has lived in Perris since 2014, Fellows said. Neighbors said they knew a large family lived there, CNN affiliate KABC reported, but they never saw any of the younger children. They said the kids would emerge occasionally at the same time to work on the lawn and would head back in together. One neighbor said the children appeared "very pale-skinned, almost like they'd never seen the sun." Another neighbor, Kimberly Milligan, said the children were thin and appeared malnourished. In 2015, Milligan said she was with her son checking out Christmas decorations on nearby homes. Some of the older Turpin children were putting up a Nativity scene outside their house, and she complimented their decorations. "They just froze," Milligan recalled. She described the parents as "standoffish -- not in a mean way." Betty Turpin, the children's grandmother, said the entire family would vacation together and had yearly passes to Disneyland. "This is a highly respectable family," she said. A series of videos on social media showed the Turpins renewing their vows at the Elvis Chapel in Las Vegas in 2013 and 2015, with the children joining them. In one ceremony, the girls, wearing the same purple plaid dresses and white shoes, lead the processional, and the boys, wearing dark suits, stand with their father. An emotional David Turpin can be seen repeating his vows in the video. The children laugh along with an Elvis impersonator, and the couple kiss as their daughters clap. In an interview with NBC, Louise Turpin's sister said she was "so heartbroken" for her nieces and nephews and surprised to learn of their living conditions. "I can't even say the words to you that I would like to say to her. I'm so angry inside. I'm mad," said Turpin's sister, whom NBC identified as Teresa Robinette. "I'm hurt," she said. "Our life wasn't perfect growing up but she didn't live like that. And neither did David." said. Robinette said her dad was a preacher when she was younger. "I feel like it's a bad dream," she said. Fellows said they previously lived in Murrieta, in southwestern Riverside County, and in Texas. The family lived in Rio Vista, Texas until 2010, and before that in Fort Worth, Texas, CNN affiliate KTVT reported. The new owners who bought the Turpin's foreclosed home in Fort Worth kept pictures of the house's condition, the station reported. Windows were broken out and boarded up. Waste covered the carpet and walls, and there were scratches on the back of doors, the station reported. Shelli Vinyard, a neighbor of the Turpins' Rio Vista home in Hill County, said she called the place "the compound." "I thought it was like a religious compound over there," she said. The family home-schooled their children and "kept them away from anybody," she recalled. Vinyard said that, at first, the family was friendly and their children played together. She recalled asking one of the children her name. The girl said they weren't allowed to tell people their names, the report said. "Then, all of a sudden, after that conversation it kind of stopped. They quit ... hanging out together and playing together," Vinyard said. In 2011, they filed for bankruptcy in California, according to court records. Ivan Trahan, an attorney who represented the couple at their bankruptcy hearing, told CNN that "there was nothing out of ordinary" about them in 2011. They "spoke lovingly of their children and even showed me their photos from Disneyland," he said. David Turpin made about $140,000 a year as an engineer at Northrop Grumman, according to the bankruptcy documents. His wife's occupation was listed as homemaker. They listed about $150,000 in assets, including about $87,000 from 401(k) plans from Lockheed Martin and Northrop Grumman, according to court papers. The documents listed debts of about $240,000, which included mostly credit cards and a foreclosed farm in Rio Vista, Texas, valued at $40,000. A Lockheed Martin spokesman confirmed Turpin worked there and left the company in 2010. In a statement, Tim Paynter, a vice president for the Northrop Grumman, referred questions about the case to authorities. "We are deeply troubled by the nature of the allegations against Mr. Turpin," the statement said. Trahan said neither of the Turpins seemed upset about going through bankruptcy. "They came with a lot of debt. We just knew there was no way they could make their payments," the lawyer said. David Turpin is listed as the principal of the Sandcastle Day School, according to the California Department of Education website. It operated out of his home Perris and opened in March 2011. The state education department does not have the authority to monitor or inspect private schools, spokesman Scott Roark said in a statement. "We are sickened by this tragedy and relieved the children are now safe and authorities are investigating," the statement said. "Full-time private schools are required to register with the state to record their students' exemption from compulsory attendance at public schools." CORRECTION: This story has been updated to give the correct spelling of Northrop Grumman and the correct age for David Turpin, who is 56. It also has been updated to give the correct date that the Turpins started living in Perris, California. The family has lived there since 2014, authorities said.